A damn good one. And quite possibly the quietest one you'll ever meet. For him, words are used only when necessary. Passing you in the hall, unnecessary. Working on a headline, necessary. But even then, his words are parsed out in brilliant moderation. That gift helped him ascend to the top of the advertising ranks to lead the creative side of Rubin Postaer and Associates, an agency that bears his name. It helped him create simple, iconic campaigns for many top brands. 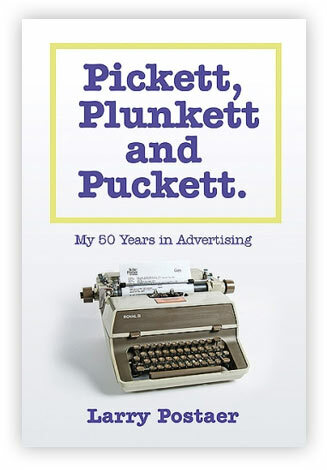 Even more, it allowed him to masterfully recount the stories of a famed 50-year advertising career in just 334 pages for "Pickett, Plunkett and Puckett." Larry has had a life and career few will ever experience. But now you can hear it from "the man" himself (we call him that). So pour a single malt and let Larry take you back to a time before tweets, where his well-chosen words tell the magical stories he's been holding onto for years.